Apache Drill is SQL Query Engine for Hadoop, NoSQL, Cloud Storage and file systems including HBase, MongoDB, MapR-DB, HDFS, MapR-FS, Amazon S3, Azure Blob Storage, Google Cloud Storage, Swift, NAS and local files. 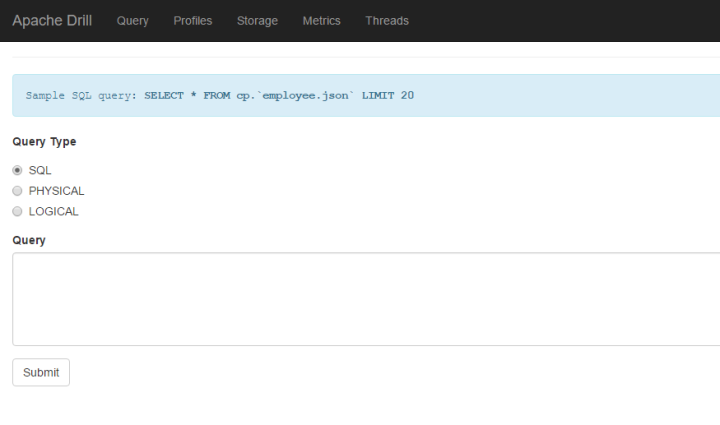 As example, we can join a collection in MongoDB with a directory of event logs in Hadoop. Apache Drill features JSON data model which enables queries on complex and nested data. Drill has extensions to SQL to easily query complex data. We can install Apache Drill on single cluster or multiple cluster. Here is how to install Apache Drill on Ubuntu 16.04 LTS single cloud server. Drillbit is Drill’s daemon which runs on each node of the cluster using ZooKeeper for all communication in the cluster. Drillbit which receives the request from the client is called Foreman. Follow our basic server setup guide to create a user with root privilege and enable other optional basic security. To exit the Drill shell, we need to run !quit as command. Rest you can read from Apache Drill’s official documentation. This Article Has Been Shared 8845 Times! Cite this article as: Abhishek Ghosh, "Install Apache Drill on Ubuntu 16.04 LTS Single Cloud Server," in The Customize Windows, August 9, 2017, April 21, 2019, https://thecustomizewindows.com/2017/08/install-apache-drill-ubuntu-16-04-lts-single-cloud-server/.